So like most things I bake, they tend to come from cravings. Yesterday, I was desperately craving a pear and almond tart, one of my favorites! I had never made one, but upon inspection of my fridge, I discovered pears… so I decided to go ahead and give it a go. I looked online and stumbled upon this wonderful blog post at Smitten Kitchen. I decided to use this recipe as my base recipe since it had such great reviews! When life gives you failed cakepops, make some cupcake toppers! A couple of weeks ago it was a coworker’s birthday. He happened to be a fan of golf, so I immediately thought to make golf ball cakepops! I’ve been making cake pops for years, and I’ve never had issues making them before until this little project rolled around! Normally, the last step in cakepops is to dip the cake ball in your melted chocolate/candy coating. However, to make accurate golf balls (as in to include the texture of a golf ball as opposed to a smooth surface of a normal cakepop) you need to use a mold. I had never made cakepops using a mold, so this was a bit of an adventure for me, one that didn’t end up quite the way I initially intended it to! But that’s the great thing about cooking, even when things don’t go perfectly, there is usually a positive way of salvaging your disaster : )! In my case, my failed cake pops turned into cupcake toppers, so all was well in the end. I will eventually make a post dedicated solely to making cakepops the way I normally make them, but for now I’ll show you the process I used for this particular project. Ok, let’s begin with the basics of cakepops! Today we’re going to discuss vanilla! In one of my previous entries I spoke about making your own vanilla, and I finally was able to get all of my ingredients to do it, so I thought I’d share my little adventure! To make vanilla extract you need only two items: vanilla beans, and some kind of alcohol (usually vodka). 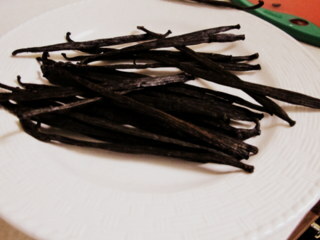 Now, if you start looking to buy vanilla beans, I highly recommend buying them online, or from a local farmer’s market. The price difference is unbelievable!! A typical vanilla bean from a chain grocery store will cost somewhere between 7-10 dollars, which is much more than the average price online (1-3 dollars). Buying vanilla beans can be a little intimidating because there are quite a few varieties and grades from which to order. It should be noted that the two most popular are Madagascar vanilla beans, and Tahitian. So which one should be used? From what I’ve gathered in my research it’s pretty simple: if you’re planning on using the vanilla in baked goods, go with Madagascar vanilla beans. Tahitian vanilla beans are milder and softer in flavor, and thus are much better suited for items that don’t need to be cooked at high temperatures. However, there is no magic rule that says you have to follow this guidance, it’s merely a suggestion : ). Because I plan on using my vanilla extract primarily for baking, I went with Madagascar vanilla beans. I also bought two types of alcohol to infuse, vodka as well as rum. vodka is often the preferred choice because it’s rather tasteless, and won’t have a flavor that competes with the vanilla. You don’t have to use a high end vodka, just one that’s relatively tasteless. I bought some vodka called RÖKK for my extract. I almost bought another type of vodka, but the clerk at the store recommended this brand because it was cheaper, as well as more pure and tasteless than the other brand I had chosen. As far as the rum, it was something I had seen a few people do, and since I do enjoy rum cake, I thought this could create a really interesting extract! There are many other types of alcohol that can be used, I’ve heard of people using Brandy as well, so feel free to experiment! Just remember to use an alcohol that’s at least 35% alcohol (70 proof). As for sizing, it really depends on how much extract you’d like to make. Both bottles that I bought where 1.75 liters which is almost 60 oz. Now let’s discuss the ratio of vanilla beans to alcohol. There doesn’t seem to any real strict rule on this. The most common I’ve seen has been 1 bean to 2 oz of alcohol, or 4 beans for 1 cup alcohol (8 oz). Some other vanilla makers recommend 5 beans to one cup. Since I ordered quite a few beans, I decided to go with the 5 beans to 8 oz of alcohol. For my 1.75 liter bottles I decided to use 36 beans for each bottle. Now with all this background information, let’s move on to the process!